Pretty sure that my husband has garnered all of his parenting skills from George Bluth on Arrested Development. This bodes quite poorly for our dear sons. Take, for example, the stories he tells the boys about ‘Larry’. Larry is apparently the son we used to have, before he played with the bathtub drain and got sucked down it. Poor, poor Larry. The moral of the story is: Never play with the bathtub drain. And then there are the stories about Darryl, and his other brother Darryl, also imaginary former children of ours. Each met equally terrible fates as a result of their naughty mischief. The kids have learned all sorts of lessons from these stories, like never to play with the fireplace screen and to always put the caps back on the markers, lest they meet the same sad fate of Larry, Darryl, or Darryl. If you haven’t seen Arrested Development, fire up your Netflix right now. You’ll laugh. And laughing is good. This pot roast is good too! I mean like, I-could-eat-this-every-night kind of good. Tender, flavorful, comforting. The idea entered my mind after looking for a pot roast recipe for a friend. 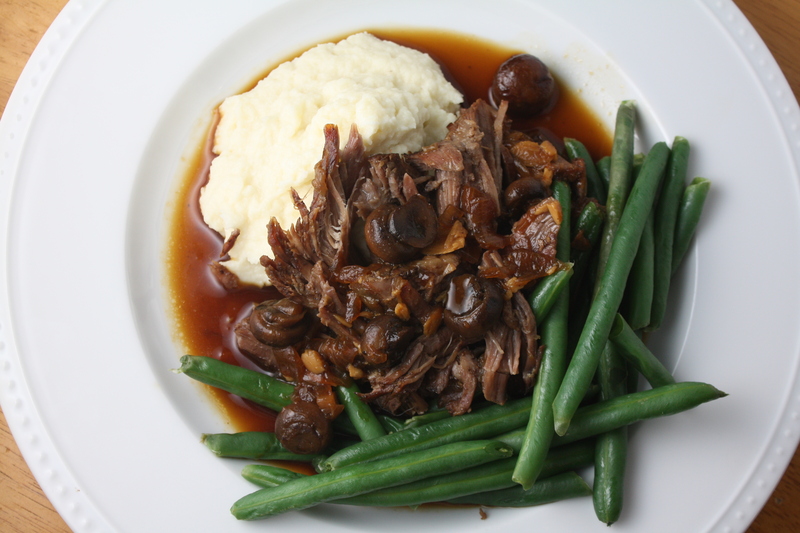 During that search, I ran across a simple pot roast with mushrooms recipe, which got my gears turning. 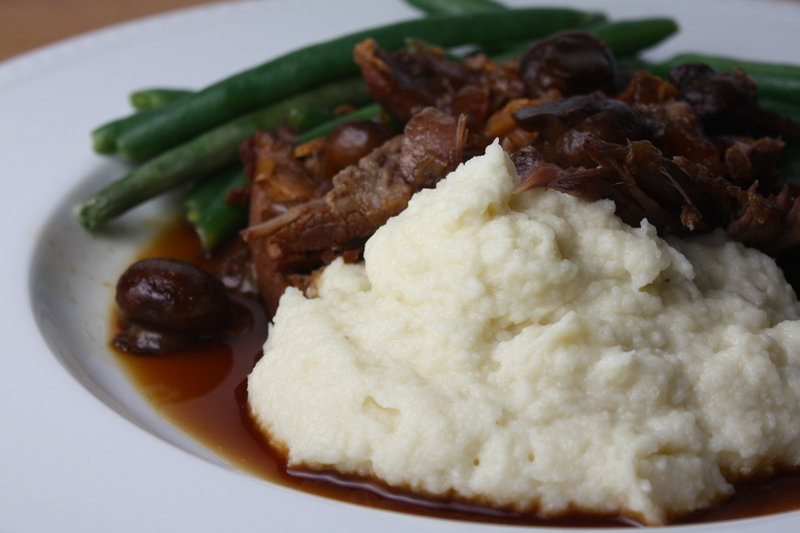 I bought the ingredients for my marsala-based twist on pot roast that afternoon. I sense this recipe is going to become a frequent Sunday night dinner. Ideally, I’d have served mashed potatoes on the side of this pot roast, but under the rules of my current diet, potatoes are a big no-no. (You thought those were mashed potatoes in the picture, didn’t ya?) So, I decided to give something else a try; a cauliflower mash. Now, you may be thinking that there is no way in H-E-double hockey sticks that mashed cauliflower is going to satisfy your mashed potato craving. I was also quite skeptical. But I’ve got to tell you, I would eat this cauliflower mash even if I weren’t on an anti-potato diet. It’s surprisingly delicious. Parmesan cheese and garlic powder make this side dish a real winner! You won’t even miss the potatoes. Preheat oven to 325 degrees. Trim the chuck roast of any excess exterior fat. Season with the salt and pepper. In a large dutch oven or oven safe pan, heat olive oil over medium/medium-high heat. Place the meat in the pan and brown on all sides, about 2-3 minutes per side. Remove the meat and set aside. Reduce the heat slightly. Add the onion and garlic. Cook for 3-5 minutes, until tender. Add the mushrooms. Cook for another minute or two. Add the marsala wine and simmer for a minute or two. Return the meat to the pan. Add the beef stock and the sprigs of parsley. The beef stock should come almost to the top of the meat, but not cover. Bring the liquid to a simmer, then cover the pan and place it in the oven. Cook for 3.5 hours. Combine all ingredients in a blender or food processor and blend until smooth. Adjust seasoning as desired. *We finished phase 1 (the hard part) of South Beach diet yesterday. As of today, we get to welcome back whole grain breads, fresh fruits, dark chocolate…yum! Posted in Beef, Food, Main Course, Recipes, Side Dishes, Vegetable and tagged beef, comfort food, Cooking, diet, easy dinner, Eating, family, Food, kids, life, low-carb, parenting, Recipes, south beach diet, vegetables, weight loss. Bookmark the permalink. Will have to the try the cauliflower mash! Beautiful dish. Wow, that looks stunning. Cauliflower mash is a great idea too. We learned about cauliflower mash when my husband was on the Atkins diet way back. It really is good! We still make it. Another hold over from the Atkins days are mashed rutabagas and mashed turnips. Good stuff! LOVE your blog. Crazy busy hockey mom here, wondering if this can be done in a slow cooker (i.e. unattended cooking)? and if so what adjustments you’d suggest? Hi there! Yes, I think this recipe could be adapted for the slow cooker. 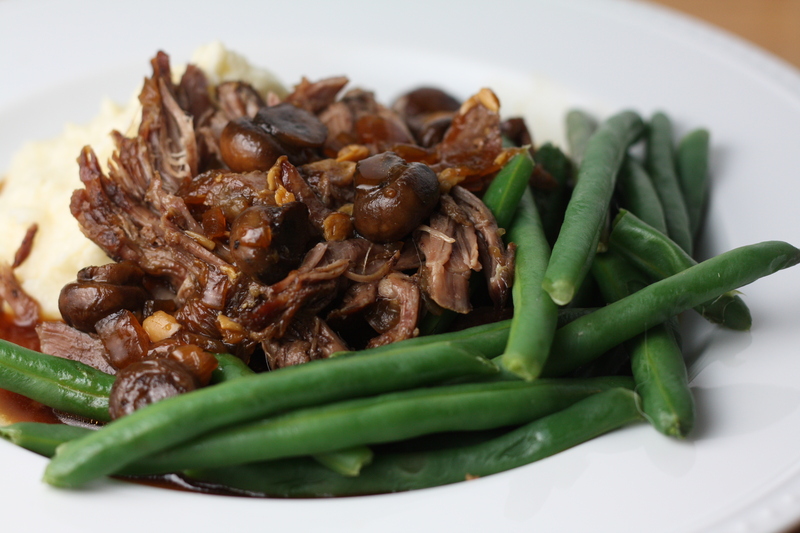 I don’t use my slow cooker enough to give you an exact adaptation, but what I think I’d try is to follow the recipe as written, up until adding the marsala wine, then transfer all of the ingredients to the slow cooker and add the beef broth. I’d reduce the beef broth, since it seems like everything gets extra liquidy in slow-cookers. You can always add more broth later, if you need. I’m guessing it would take about 9 hours on low or 5-6 on high. If the sauce is too watery at the end, transfer it to stovetop and let it boil until it reduces to your liking. Hope that helps! Thanks for reading! Excellent dish. It was a snowy Saturday here on Long Island and I needed something to slow cook for my family. We all loved it! (Made mashed potatoes instead of the cauliflower though). Thanks!! PS . . . Made the mini quiches for brunch today too. Very tasty. Those look like real potatoes. Very nice! Popping over from Amy’s notebook post… this looks absolutely wonderful. My husband (and me too by default) has been doing South Beach for a while. He has lost over 50 pounds! We just had pot roast in the last week, but I’m going to add to the menu in a week or two. Thanks!